They'll have 1 thing in common - they all got used to Photoshop first. GIMP isn't perfect. It's got rough edges. It is developed by volunteers, it is not backed by a huge commercial effort like Photoshop nor is it sold for a huge price tag. Considering that, for 98% of image editing requirements GIMP is just as good as Photoshop. Only if you are in an elite upper tier of artists would it actually be inadequate. If you are used to Photoshop, you'll find GIMP horrible to use. The same is true in reverse. They are difficult applications with different structures and different approaches to many tasks. It's like going from a Mac to Windows and vice versa. You have to unlearn what you know and relearn something else, and for many that is too much to ask. However to lack the perspective to understand this basic principle - that you prefer what you know - and lay into the work of the GIMP developers with very unconstructive criticisms is hardly helping anybody. Given it is open source, why not engage them, or why not try to implement improvements? Oh, that would take effort. Trolling online takes no effort whatsoever! The GIMP has a ton of great features, is constantly improving, and is never going to cost you money. It will just cost you a bit of your time to learn how to use it. You will be amazed how awesome this software is. A lot of premium features simillar to phtoshop. ut it's totally free. So you can enjoy all this functionality and not pay money. But it would be great to donate the cost of a premium coffee once to the project. New version of GIMP rocks! I've just recently installed the new version of GIMP - 2.8, and I already love it. The previous 2.6 did what I wanted anyway. But this one does even more and in much smoother convenient way. 10 out of 10. Who needs to pay hundreds of bucks for PS now (except for those involved in professional pre-print routine)? I use it in Windows and Linux and it works pretty much the same in either environment. I beg to differ about 2.8, the work flow is messed up. With 2.8 when you open a photo, say a jpg, it is imported. When you get done with your edits you have to export it. If you want to export it to the same name there is no keyboard short cut for that action. After you export, "save", it and you close the window you have to deal with a popup that asks if you want to save changes. Bad work flow, bad user experience. Saying that I have been happy with previous versions. G'MIC is a must have free plug-in suite. While GIMP lacks much of the polish of Photoshop it is in every man's budget and ought be installed on every desktop with or without photoshop. 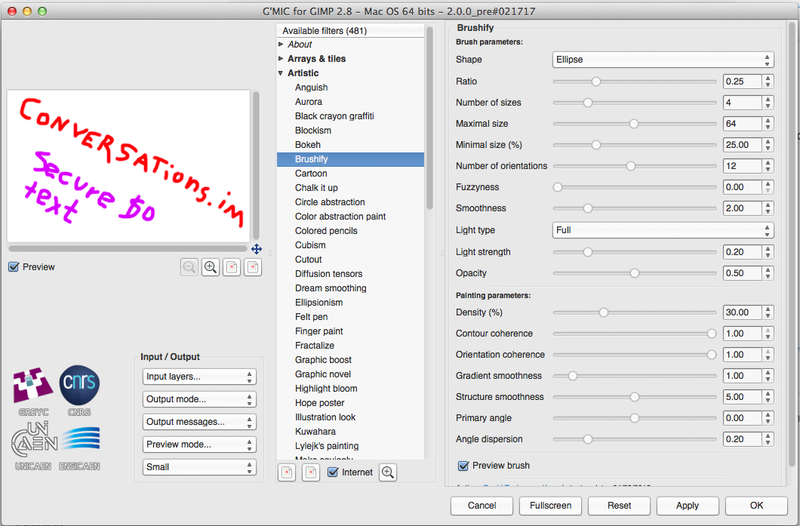 GIMP is rumored to be expanding layer blend modes. Is getting better. The cluttery "everything in a different window" interface is fixed. A dark theme has been added, the crappy-looking icons have been fixed, its features have become more organized and simple. Don't get me wrong. I'm not a fan of GIMP. But at least I see the team making improvements so I'll give them credit for trying. provides the Paths Tool on which drawings can be created with precision using a mouse device. Gimp 2.9.2 Development Version is awesome ! Gimp 2.9 version is not for professionals ! but if you love gimp you might give it a try ! it comes with these feature ! 16/32bit per color channel processing. On-canvas preview for many filters. Experimental hardware-accelerated rendering and processing via OpenCL. With the 2018 update, it finally has a lot of features that I need as a (half) power user. A "magic wand" tool would still be nice, as mask selection can still be a pain, but it's free! I've been surprised what I could do with it, and I am no expert. For example, I took a picture of an object that some idiot wrote $15 in very large letters in permanent black marker on, and within about five minutes, I made it so it was very hard to tell that it was ever there. I've also taken pictures that were originally of square objects, but were skewed/distorted because of the camera angle, and made them look "right" again. And so on. Works great in Linux as well as Windows. For being free, open source software, it's amazingly good. I fully admit to being cheap, but I'd never spend my money on Photoshop after seeing how well GIMP works. GIMP does what Paint.net doesn't. While driving you mad. Its great, it has a lot of features and its free! A very good software, Free (in both senses of the word) and more than enough for more users.